Product Consists: Hersheys Creamy Milk Chocolate Bar (Weight: 40 Gms), Hersheys Cookies n Cream Chocolate Bar (Weight: 40 Gms), Cadbury Dairy Milk Silk Chocolate Bar (Weight: 55 Gms), Cadbury Bournville Rich Cocoa 50% Dark Bar (Weight: 31 Gms), Almond (Weight ; 100 Gms), Pistachio Nut (Weight: 100 Gms) Along with 2 Rakhis and Rakhi Greeting Card. 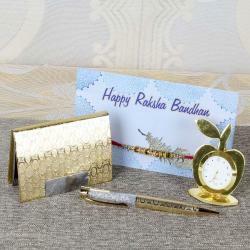 Raksha Bandhan is one of the most special and famous festival. In this occasion, the sister ties a Rakhi thread around her brother as an expression of her emotion. 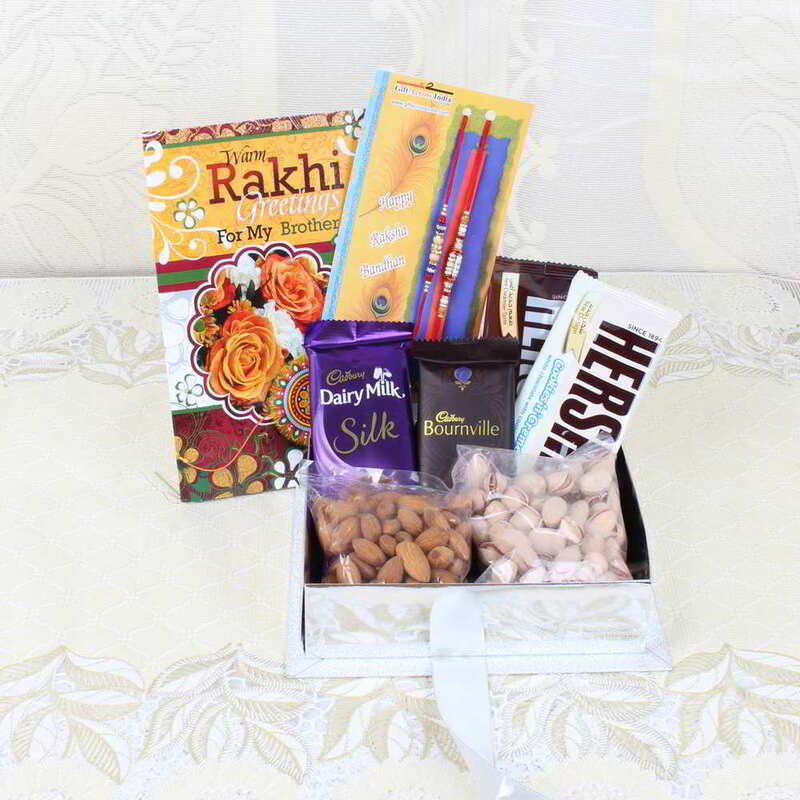 The brother gives a memorable gift to her sister, and for this there is a broad range of the things available in the market such as a chocolate box, dry fruits boxes, sweet boxes, personal gift, cosmetic hampers and much more. 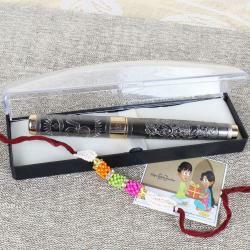 So you can purchase the best gift for your brother. 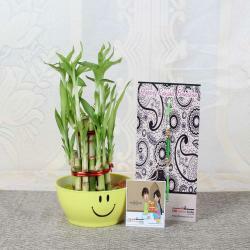 The Rakhi special gifts box helps you to express your feeling and care for your sister. Gifting on the Raksha Bandhan contributes to strengthening your relationship and also is the best way to show your affection. Product Consists: Hersheys Creamy Milk Chocolate Bar (Weight: 40 Gms), Hersheys Cookies n Cream Chocolate Bar (Weight: 40 Gms), Cadbury Dairy Milk Silk Chocolate Bar (Weight: 55 Gms), Cadbury Bournville Rich Cocoa 50% Dark Bar (Weight: 31 Gms), Almond (Weight ; 100 Gms), Pistachio Nut (Weight: 100 Gms) Along with 2 Rakhis and Rakhi Greeting Card.